The Armorcast Products Company line of Fiberglass Vaults and Manholes are designed to provide maximum strength and durability. Lighter weight than traditional concrete, they are easily installed without special equipment. Superior strength and longevity. Fiberglass bodies are easily field cut. Meets all WUC and SCTE / ANSI 77 specifications. 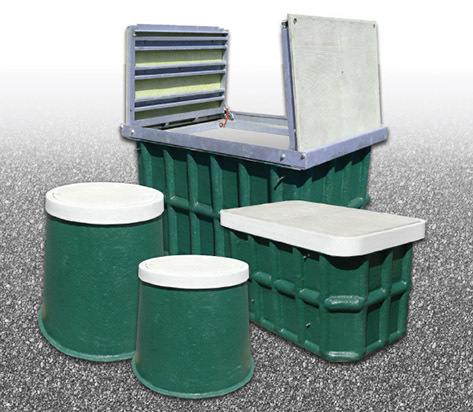 Vaults are available with one and two piece covers, or Torsion Frame / Cover for ease of opening. Cast Iron and Cover options allow for full H20 street use.